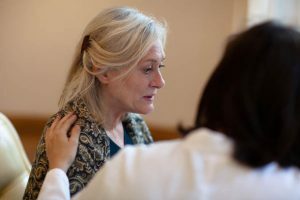 Memory loss that disrupts daily life may be an Alzheimer’s disease early warning sign or a symptom of another dementia. Alzheimer’s is a brain disease that causes a slow decline in memory, thinking and reasoning skills. The disease is the only cause of death among the top 10 in America without a way to prevent, cure or even slow its progression. There are 10 Alzheimer’s disease early warning signs and symptoms that should not be ignored. People experiencing any one of these should see a healthcare professional. This previous post [Know the 10 Signs of Alzheimer’s: Early Detection Matters], one of the most-read posts on our FirstLight blog, features a helpful infographic from the Alzheimer’s Association that explains these 10 signs. We thought it was worth re-posting. At FirstLight Home Care, we’ve developed dementia care plans to help people who are suffering from dementia or Alzheimer’s cope with the anxiety, depression, confusion and isolation that is often associated with the disease. Our unique, personal programs at home help not only the dementia sufferer but the family as a whole. For more articles like this, subscribe to our weekly Home Care News.